I’ve restarted that age old practice of handing out business cards after more than 20 years of refusing to do so. It is so ‘not’ correct in a post modern Internet-y digital world. Right? Wrong. Mine are not corporate compliant or even remotely brand compliant. They are far far from that corporate stricture. 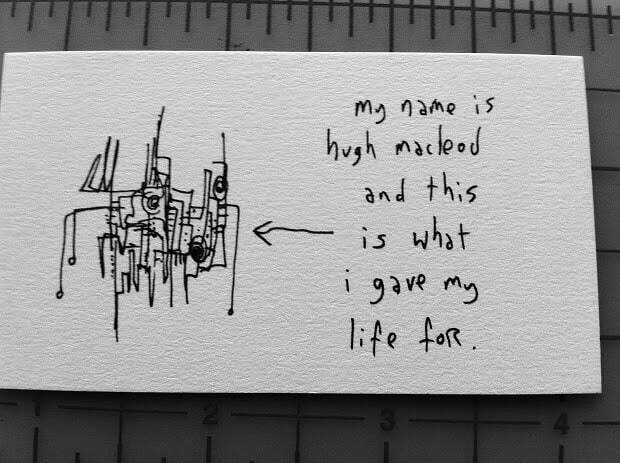 They’re “Hugh Cards” – as in Gapingvoid Gallery that are drawn from the extensive library of cartoons by my old friend Hugh MacLeod. They’re conversation starters in part because I ask those I meet to choose which of the various cartoons they’d like to keep. Some keep two. When I said that Hugh and I have known each other a lot of years, the conversation then became more animated and within a matter of minutes I’m getting this fellow’s entire life story including how he rejected offers from Facebook to work in another field in which he became recognized and how much he loves his life. Ten minutes later and my free trial for a certain software is being extended and I am lined up to get some gratis training on said software. I really appreciate that. 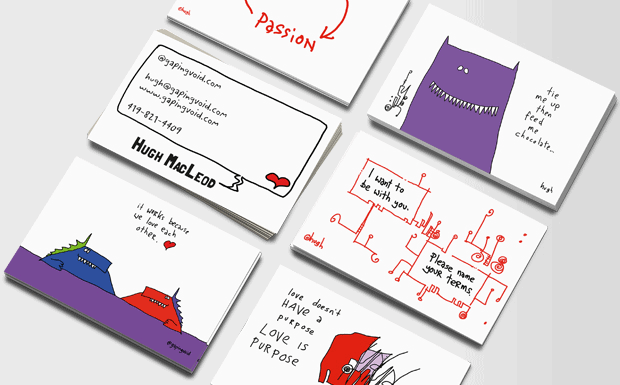 Hugh talks about the power of business cards as social objects. I’m glad mine aren’t corporate compliant. I hope Hugh sees this… as for anyone else – it’s your choice what you do about this but most will do nothing. "The more enemies Alain De Botton makes in the art world, the better off for all of us."